I've been writing this blog since 2008. Previously I was using BlogEngine.net to power my blog but lately I've been on the lookout for something a bit different. I love Wordpress and the ease of use that brings, especially when upgrading or installing modules. At the time of writing there is no 'one click' install option for BlogEngine and updating my blog was becoming a chore with each release. Wow, it's been ages since my last post here. I've been super busy with some new exciting work over at Dragnet Systems lately which is coming to an end shortly giving me more time to post some new articles. Over the coming weeks I'll post some articles explaining how to get the most from MVC3 for real world scenarios. A lot of my work at the moment focuses on MVC3 with Entity Framework Code First, Twitter's BootStrap and jQuery to build amazing web apps for businesses. I've also been taking the time to learn how to setup my MVC projects to use dependency injection so that my code is much neater and tidier. It took ages to get my head around it initially but it's starting to pay off now which is great. Just a quick note to let you know that my CoolBlue theme is now BlogEngine 2.0 compatible. Head on over to the original post to download this file. This theme plays nice with Disqus if you want to use that commenting system and will work with the new login page links out of the box. I have also included a BlogEngine 1.6 version of the theme if anyone wants to continue using the older version of BlogEngine. I should have a new theme available for BlogEngine 2.0 in a few weeks. If you come across a nice looking free HTML template that you would like me to convert to BlogEngine please let me know in the comments below. I just updated my own blog to run the new BlogEngine and it was pretty painless to setup. The only snag is that I'm using Disqus as my commenting system so I've lost all my older comments because I'm using this new system. It's a small price to pay as personally I think Disqus is a better comment system. I really like BlogEngine.net but I've found it frustrating to get some really nice modern themes for it. There are a good few examples out there and I've blogged before on where to go to get some good themes but unfortunately the vast majority of themes look dated by today's standards. I've used GoDaddy.com for a number of years but recently noticed that their pricing was not as good as some of the competition. I also had my domains "protected" by DomainsByProxy.com which meant that I was locked into paying an extra $8.99 per domain for the privilege of having my whois details hidden. My theme is now BlogEngine 2.0 compatible. Click here to download it now for your blog. I've just created my first BlogEngine theme. Download it now over here. More to follow so come back soon. I have updated my own site to use a theme called Scruffy. 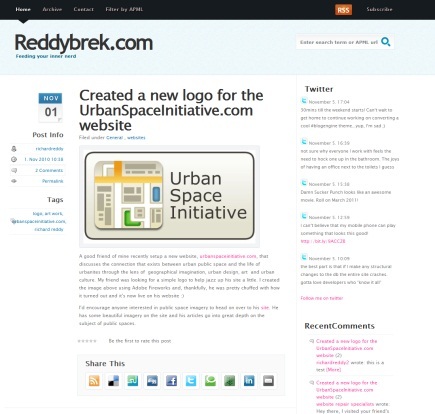 This theme has been updated to take full advantage of the new Blog Engine 1.6 feature set. To download the theme head on over to John Rummell's site here. I just wanted to update this post to help keep it fresh. If you head over to CodePlex there is a download pack containing every existing theme for BlogEngine...well that's what they say but I know of a few that it's missing. Still, it's handy to have over 90% of the themes in the one download. I have also cleaned up the list below as some of the links were dead. If anyone has any new sites with more than 1 theme on them please let me know and I will update the list below. Since I started using BlogEngine.net I noticed that the one thing everyone complains about is that the themes are hard to find. I'd have to agree. There are theme sites out there but for some reason they're a little tricky to find. Below is a list of the current BlogEngine theme sites I have found. These links aren't in any order. I'm also fairly confident that there are tons more sites out there with themes so feel free to add them to the comments and I'll update the list. blogenginetheme.com - This is one of the larger theme collection sites out there for BlogEngine. The site promotes theme authors to upgrade their themes to be BE 1.5+ compatible by offering to place them on the first page of results if they do. This is a great idea to get some of the better BE 1.3/1.4 themes updated for use on the newer BlogEngine codebase. onesoft.dk - some fantastic themes here and this is actually where I downloaded my first theme from. Unfortunately the site isn't updated as much as it was in the past but there are still some really nice themes to be found here. Mainly BE 1.3/1.4 themes here. jankoatwarpspeed.com - This is one of my favourite website to visit. Janko is an ASP.NET guy like most of us (or at least I'm assuming you are because you use blogengine.net!) 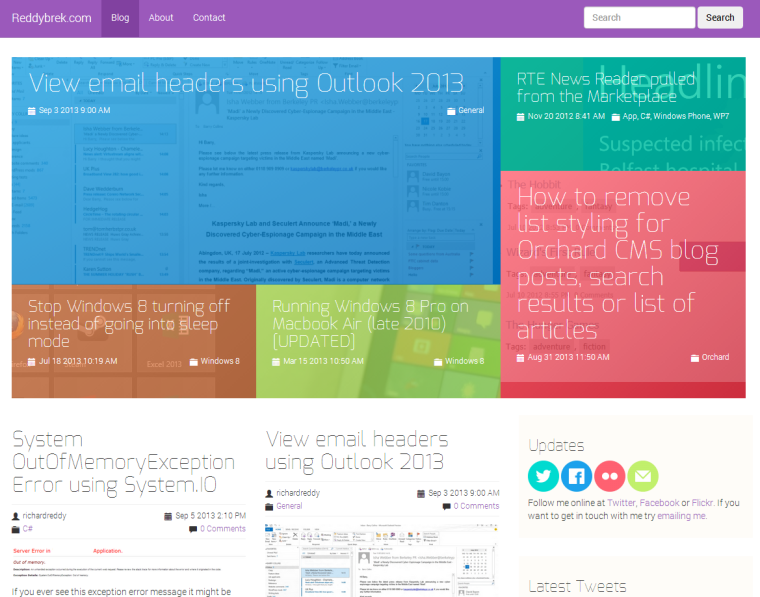 and regularly has great posts on .net and jquery that you might find interesting. As for themes he has a small collection (compared to the above list) but there are some nice themes here. You might find that you click through for the themes but stay for the content! mooglegiant.net - There is a small collection of themes on this site. The themes are fairly basic in structure but sometimes that can be exactly what you need. I'm adding here because these themes can be easy and quick to modify and adjust. When you just want to knock out a blog for a client and need just a simple theme, one of these could hit the spot. rtur.net - A small selection of themes (by which I mean 2) on this site but the developer keeps them up to date for BE 1.5.
geekiest.net - This blogger has a few blogengine themes up on his site. Many of the themes use designs from open source design sites but the list is always growing. Obviously there is of course the BlogEngine.net site itself which has a large collection of themes on it's theme page and over at the unofficial forum. Most of the themes on those links appear to be older themes for BE 1.3/1.4. Finally, if you're looking to get stuck in and making your own theme you can read a quick how to over at Al Nyveldt's blog. The screencast is targeted at slightly older versions of BE but the process is pretty much the same for 1.5. He is one of the main developers of BlogEngine and his site has tons of tips and tricks to get the most out of BlogEngine. If you have any suggestions for some great theme sites out there for BlogEngine let me know and I'll be sure to include them on the list.